As my videos may have indicated; although my tricopter is working reasonably well my piloting could still use some work. I decided to get a mini/micro quadcopter that will work with my existing controller to learn on as they are so light weight crashes don’t seem to bother them. 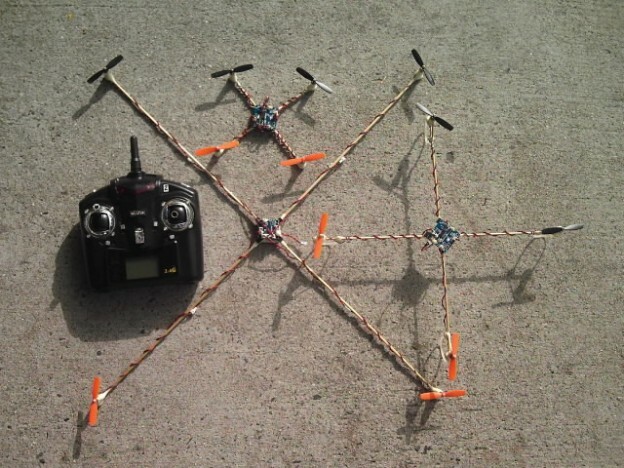 After a bit of research the $18 diy quad by dave1993 looks like a winning option. Total for just the copter bits (no battery) was $16.75, with battery and charger you’re at $23.25, $28.05 with spare battery and props. Pretty cheap for a usable looking quad thats compatible with the 9x transmitter! If you don’t already have a transmitter a cheap compatible option is the WLtoys V929 V939 V949 Beetle 4-Axis Quadcopter 2.4G Transmitter E728 $14.85. Its the same one pictured above. I don’t know what the quality is like on though it certainly appears to work. You can also get the V939 bind and fly (so it doesn’t include a controller) pre-built. Its actually quite cheap on its own at ~$30.